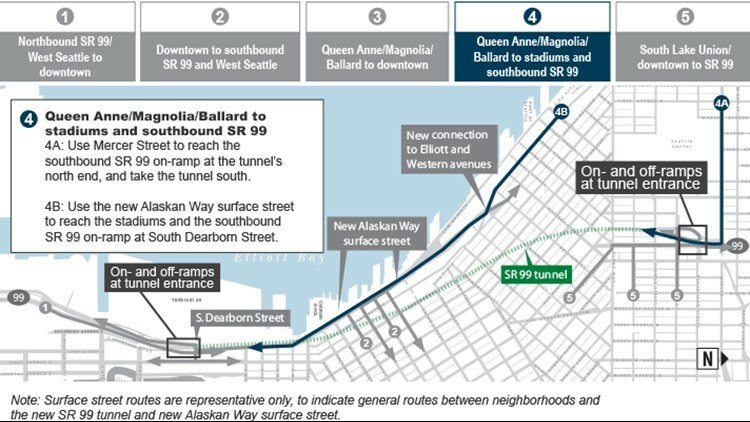 After the SR 99 tunnel opens through downtown Seattle, road configurations will change significantly. Here's a guide for southbound drivers to navigate surface streets in South Lake Union and SODO after the tunnel opens. If you're a northbound driver, click here for those details. The north portal of the tunnel will be on SR 99 between Mercer and Harrison Streets. If you are already on SR 99 and you want to get off before the tunnel, you can take the left-side exit to Harrison Street towards downtown Seattle. Aurora Avenue North will be raised over the Battery Street Tunnel and extended three blocks to connect to Denny Way. Harrison Street will be connected across Aurora at the time of the tunnel opening, and drivers can turn right or left on Harrison after exiting. Thomas and John Streets will also eventually be reconnected across Aurora, but that will not be completed at the time of the tunnel opening. The last SR 99 exit to Queen Anne before the tunnel is Roy Street. If you aren’t already on SR 99 and want to enter the tunnel, the southbound on-ramp is on Sixth Avenue North between Mercer and Harrison Streets. The road configuration at the north portal of the new Seattle tunnel. The south end portal of the tunnel is on SR 99 at South Royal Brougham Way, just west of CenturyLink Field. If you want to get off SR 99, there is a left-side off-ramp to South Royal Brougham Way and Frontage Road. To get to I-5 or I-90, take the SR 99 exit to South Royal Brougham Way. You can take Frontage Road or South Royal Brougham Way to get to the entrance off Edgar Martinez Drive. You can no longer exit onto Atlantic Street to get to the interstates. Road configuration of the SR 99 tunnel's south portal. If you’re coming from the west side of the city, you won’t be able to get on SR 99 at Elliott Avenue, like you may have done with the Viaduct. 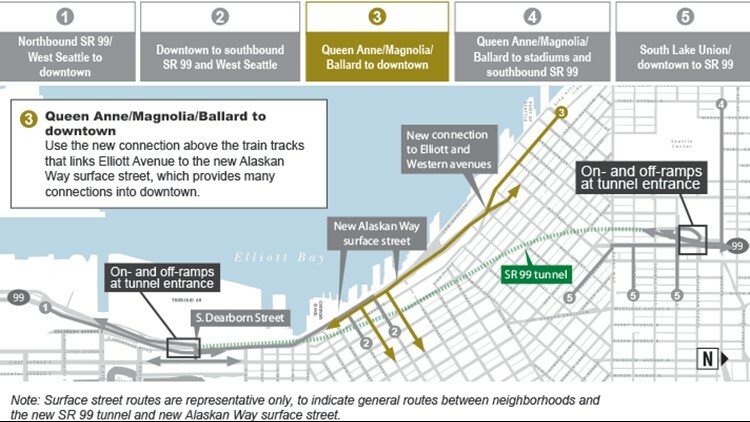 Instead, Elliott will connect to Alaskan Way, and there’s an on-ramp to SR 99 south at Alaskan Way and South Dearborn Street after the tunnel. Alaskan Way also offers connections to downtown. RELATED: What will Seattle traffic look like without the viaduct? You can also get on southbound SR 99 from Lower Queen Anne at Sixth Avenue North and Harrison Street. 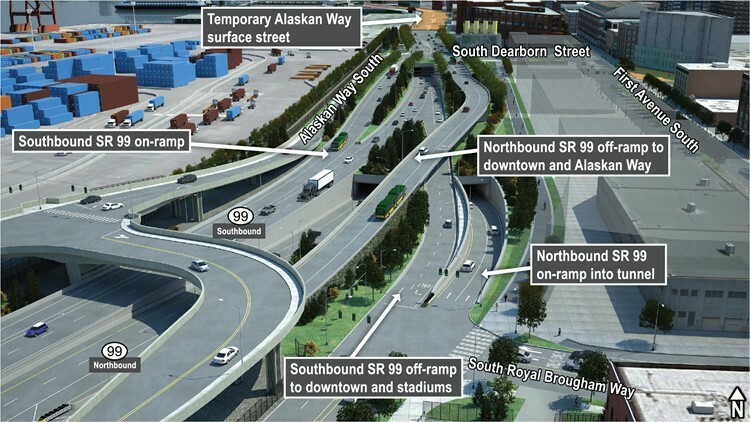 Elliott will connect to Alaskan Way, and there's an on-ramp to SR 99 south at Alaskan Way and South Dearborn Street after the tunnel. You can also get on SR 99 before the tunnel in Queen Anne at Sixth Avenue North and Harrison Street. Elliott Avenue connects to Alaskan Way, which offers connections to downtown. Take the on-ramp to southbound SR 99 at South Dearborn Street and Alaskan Way. You can also take First Avenue South from downtown to reach the on-ramp. 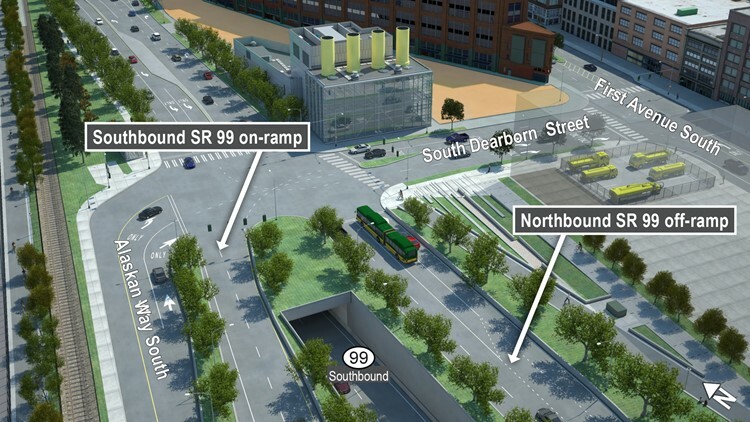 Drivers can exit northbound SR 99 onto the newly constructed South Dearborn Street to First Avenue South or onto Alaskan Way South. There will not be an entrance to SR 99 on Columbia Street anymore. Your best option is to get on southbound SR 99 after the tunnel at Alaskan Way and South Dearborn Street, which is accessible off First Avenue. The exit after the Battery Street Tunnel to Western Avenue is also going away. 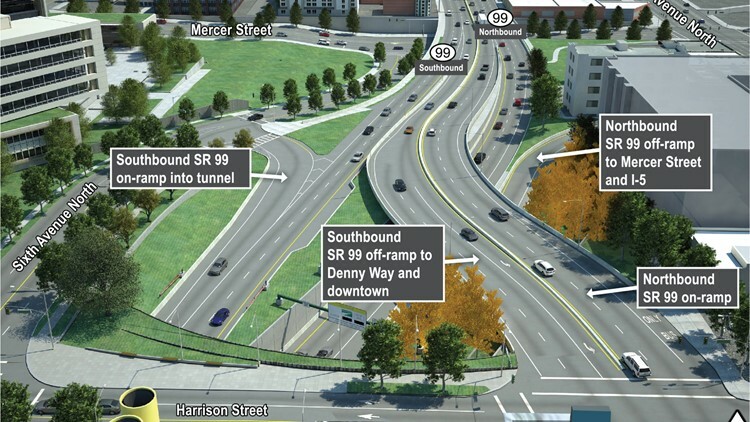 Instead, you can exit SR 99 before the tunnel at Aurora Avenue North and Harrison Street. 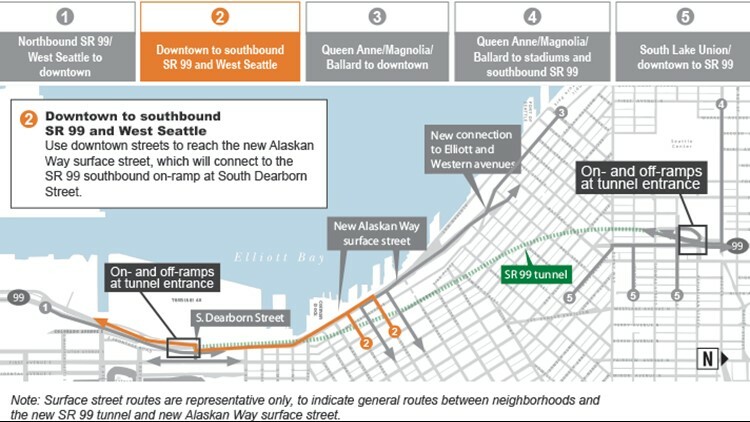 There will not be an entrance to SR 99 on Columbia Street anymore, and the exit after the Battery Street Tunnel to Western Avenue is also going away. Join KING 5's Seattle Tunnel Traffic Facebook group to stay up-to-date on the latest Seattle tunnel and viaduct news.